A chord plays, then another. You've heard it before — in a bar, on the radio, at a campfire. In Canadian culture, the music of The Tragically Hip is anthemic and omnipresent. In Long Time Running, the new documentary about the band's final tour, directors Jennifer Baichwal and Nick de Pencier waste no time establishing that fact with shots of all-ages crowds singing along from coast to coast. They return to this image frequently, building a relationship between band and fan that stretches far beyond the 30 year lifespan of the act. Most music docs rely on enjoyment of (or, at a minimum, familiarity with) the artist's back catalog. 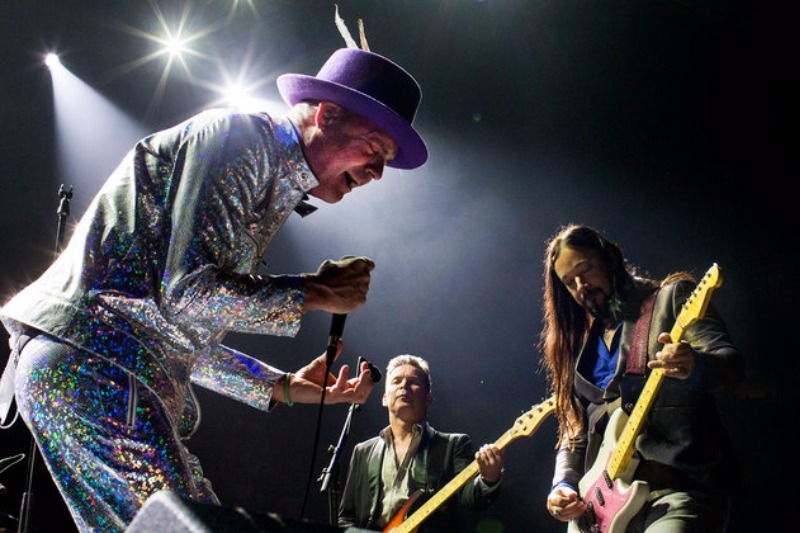 Hip frontman Gord Downie wanted to create a viewing experience that offered something more: according to Baichwal, his personal request was for her to "make the type of film [that he had] never seen". He'd be relieved, then, to hear that the film stands firmly on its own merits. Gord Downie performs with bandmates Gord Sinclair and Rob Baker. More than a simple tour travelogue or concert film, this is a story so rich and human that screenwriters everywhere will feel a twinge of jealousy. In early 2016, Downie was diagnosed with terminal brain cancer. After a series of treatments, including a surgery to remove his temporal lobe, he and his bandmates agreed to tempt fate and move forward with plans for a tour in support of their latest album, Man Machine Poem. Though Downie needs several teleprompters to even remember the lyrics to his own songs, the camera shows us a man possessed by melody and still roiling with rockstar charisma. His illness is not framed as a focus, but the suffering and catharsis he experiences are impossible to miss as they play out on a national scale. Long Time Running finds its truth in natural moments that are packed with emotion. There is pure and reciprocal gratitude when a costume designer stitches her favorite lyrics inside a hat she is making to be worn on stage, and when Downie kisses his bandmates before each show and thanks them sincerely for staying by his side. There is wrenching pain as the tour comes to a close and he wails an anguished "no" into the microphone, not ready for it — for everything — to be over. Like its subject, the film doesn't so much confront mortality; it simply admits it, facing it down with grace and passion and dignity, and thus is able to transcend it. The song you've heard before is one that will continue to play for a long, long time.